Cuthbert Collingwood was born in Newcastle upon Tyne in 1748 into a large family, the eldest of three sons. The Collingwoods were an old Northumbrian family, though the Admiral’s father, also Cuthbert, was a trader without land or fortune. The building in which the family lived, on the steep, narrow street called The Side, which leads from St Nicholas’s Cathedral down towards the Quayside, has long gone. But above the doorway to Milburn House, just below the Black Gate, a plaque and a bust record its location. The castle and the city’s walls are a continuing reminder that the Newcastle of Collingwood’s day was still a border garrison whose gates and walls had been manned as recently as 1745 against the Jacobite rebellion. But Newcastle was also an international city of trade. The Quayside bustled with shipping from across the world. Coals from the North-East’s apparently inexhaustible mines were exported across the seven seas and in return came exotic spices from the Far East, tobacco from America, tea from India, sugar and rum from the West Indies. But above all, and almost more precious than goods, was news — from Canada and Hanover, from Stettin and Petersburg and the Cape. Britain, flexing her imperial muscles as never before, was at the centre of the world and the imaginations of young boys growing up here were fired by the exploits of daring naval captains and heroic generals. The oldest son of a trader might have been expected to follow his father into business. But the business was failing. The Collingwoods used their family connections to procure for Cuthbert and his brother Wilfred berths as midshipmen in the Royal Navy. Thus ended the future Admiral’s short period of formal education at Newcastle’s famous Royal Grammar School, where he had already become friends with John Scott, the future Lord Eldon. The Collingwood boys went to sea in 1761 at the ages of 13 and 11 respectively in the 28-gun frigate Shannon, commanded by Robert Braithwaite, a relative of Mrs Collingwood. As midshipmen they would be trained as future officers and gentlemen. They would serve a long apprenticeship, with at least six years before they could be considered for examination as lieutenants. In Cuthbert’s case he did not become lieutenant until the age of 27, after seeing his first action — the amphibious assault on Bunker Hill near Boston which signalled the start of the American War of Independence in 1775. The first of Collingwood’s legendary letters dates from this period, but his midshipman’s journals, one of which survives from tours in the Mediterranean and West Indies, shows that his character was fully formed at an early age. He was conscientious and a gifted seaman. He had mastered navigation, was cool and brave under fire. What is more, he was a compassionate and deeply humane officer who hated flogging and grieved when he lost a shipmate. He was also, like his much younger friend Horatio Nelson, whom he first met in 1773, ambitious and zealous for the honour of the navy and the King. England’s future saviours first served together under Sir Peter Parker on the West Indies station in 1778. Nelson had achieved the rank of Post-Captain at the unusually young age of 20. Collingwood, now 30, was suffering as a lieutenant under a tyrannical and ineffective commander called Robert Haswell in the 14-gun sloop Hornet. 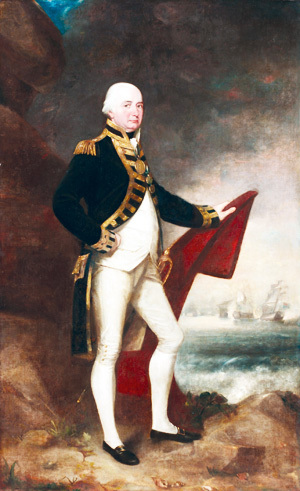 Nelson persuaded Parker to bring Collingwood under his command, first as lieutenant in the frigate Lowestoffe, then as Commander in the brig Badger, and then as Post-Captain in Hinchinbroke. Because of the ladder system of seniority in the Royal Navy, Nelson would retain a few crucial months’ seniority over his friend up until his death at Trafalgar 25 years later. Their first adventure together was disastrous. Nelson, on more or less his own authority, accompanied an army expedition up the San Juan River (in modern Nicaragua) looking for a new route to the Pacific Ocean and he nearly died of fever. Collingwood, stationed at the mouth of the river in support, lost 180 of his 200 men to malaria and the ‘yellow jack’. Nelson returned almost lifeless to England. Collingwood remained in the Indies and survived shipwreck in a great hurricane off Jamaica in 1781. Nelson’s and Collingwood’s lives seemed intertwined. In 1784 they were stationed together again in the West Indies. Collingwood was based at English Harbour in Antigua, charged with stemming the now-illegal trade between the islands and the new United States. His zealous enforcement of the so-called Navigation Acts won him few friends among the merchants of the Caribbean. His consolation was the company of the navy’s commissioner in Antigua, John Moutray, and, perhaps even more, that of Mary Moutray, the commissioner’s wife. She was educated and intelligent, delightful company and a gifted hostess. When Nelson came out to join Collingwood these twin epitomes of England’s naval officer class were united in their determination to stamp out smuggling, and united in their affection for Mrs Moutray. She was eventually forced to return to England with her ailing husband, but the two men remained friends with her for the rest of their lives. Collingwood himself returned to England in 1786 and spent the only significant period of his life ashore. A year after leaving the West Indies he received the devastating news in a touching letter from Nelson that Wilfred, his brother and fellow captain, had died of an illness. When he was not in London using his connections to try to get another ship (in peace-time there was tremendous competition for each command as much of the fleet was laid-up) he was at home in Northumberland. Such was the status of a captain in the Navy, and so impressive a man had Collingwood become after nearly 20 years at sea, that he was able to successfully court the daughter of the Mayor of Newcastle, Sarah Blackett, whom he married in 1791. They went to live in Morpeth, in the house that still bears his name on Oldgate on the banks of the River Wansbeck. They had two daughters, little Sal and Mary Patience. For the rest of his life Collingwood’s letters reveal the depth of affection in which he held his wife and the girls, his home in Morpeth, and the country and people of Northumberland. The old legend that he walked along the lanes of the county sowing acorns so that England’s navy should never want for oak trees is true: he was an early and conspicuous conservationist. The world was changing. Britain was having to adapt to the loss of her most precious colony. The industrial revolution was transforming her domestic landscape. Collingwood’s fellow Northumbrians George Stephenson and William Hedley, still in their shorts, would become pioneers of the locomotive. Across the English Channel, a new revolution was brewing in France. Within two years the French would have executed their king and Britain would be at war. Neither Collingwood nor Nelson would survive that war. Collingwood’s long experience as a seaman and officer were put to good use. He was a consummate professional. His ability to read the mind of the enemy and of his own men was admired by all those who knew and served with him. He was reserved in public, acutely conscious of both his provincial origins and of the isolation that a senior officer must impose on himself. He could not be friends with junior officers, nor with the men of the lower decks. Nevertheless, his compassion for their welfare and his sense of community with comrades of all ranks is unmistakeable from both his correspondence and from the testimony of those whom he commanded. He was known to weep at the end of a commission when he had to pay his ship’s company off; and there were wise heads at the Admiralty in London who knew that they could confidently send him troublemakers. Compassionate he may have been, but it was said that one of his looks of displeasure was worse than a dozen lashes at the gangway. He was not a man whose authority one would challenge. 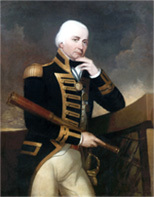 Collingwood fought in his first great sea battle against the French in 1794 at the age of 46. He was captain on Admiral Bowyer’s flagship Barfleur, a first-rate ship-of-the-line carrying 98 guns and more than 800 men. Known as the Glorious First of June, the battle was not in truth particularly glorious. The British fleet failed to intercept a grain convoy from America heading to France and the two fleets both retired with several ships badly damaged. More insulting than the result, from Collingwood’s point of view, was that most of the captains in the British fleet received medals from the king. Collingwood, for reasons, he believed, of personal malice, did not. It was an almost unbearable professional blow in spite of the kind support he received from many colleagues, Nelson included. Collingwood was unable to right this wrong for three years. During that time he served in the Mediterranean with Nelson under Sir John Jervis. Jervis’s 15-strong squadron, though small, was now trained to a peak of sea-going efficiency and battle readiness, on permanent blockade of the French and Spanish fleets between Cadiz and Toulon. Collingwood, in the 74-gun HMS Excellent, was perfectly in agreement with Jervis that discipline and gunnery would be the secret to beating the enemy. Collingwood at this time trained his crews to fire an extraordinary three broadsides in three and a half minutes — a rate never bettered in the age of sail. In tribute, the Royal Navy’s school of gunnery at Fareham is named HMS Collingwood. Since 1794 the British had been developing new naval tactics at sea while the French and Spanish fleets kept safe in their harbours. Jervis, Nelson, Collingwood and other forward-thinking officers had begun to believe that the enemy must be annihilated by destroying its ships, permanently removing the threat of future fleet actions. Against a Spanish fleet of 25 ships off Cape St Vincent, at the extreme south-west corner of Portugal, they got their chance to prove their new ideas. Nelson, impetuous, attacked first but was soon in trouble and surrounded. Collingwood, blazing away, came to his rescue and destroyed four enemy ships in the process. Nelson won undying fame. Collingwood won two medals (the second to make up for the previous slight) and the admiration of his peers. The following years were filled with hard sea-miles, endless blockade and hardship in all weathers, with only very short periods ashore and fewer at home. After the brief Peace of Amiens in 1802, at which time Collingwood became a rear admiral and saw his wife and children for the last time, the long, grinding build-up to the Trafalgar campaign saw him more or less continuously stationed off Brest, blockading the French Atlantic fleet. Collingwood’s letters during these years, alternately wistful, rhetorically anti-French, grumpy and indomitable, reveal a middle-aged man, old before his time through overwork and what these days we would call micro-management. He was indulgent to his midshipman and sailors, hard on his officers, unstinting in his duty. His only companion was his faithful dog Bounce, an almost perfect naval dog except for its dislike of gunfire. Collingwood was known to sing poor Bounce to sleep in his own cot with Shakespearean sonnets adapted to canine sensibilities. If long years of war and service had worn him to a thread, his famous wit survived intact. His put-downs were the stuff of legend and his correspondence, especially with his sisters and sisters-in-law, is full or charm and gossip. His handwriting, almost to the end, was perfect copperplate with a flourish of the tail on every ‘d’. In the summer of 1805 Collingwood pulled off a masterstroke. Blockading the Spanish fleet in Cadiz with just four ships, he found himself one morning confronted with Admiral Villeneuve’s French battle fleet, newly arrived from the Indies having given Nelson the slip. Collingwood managed to convince the French, without firing a shot, that he had waiting just over the horizon a large number of reinforcements and, after what must have been a horribly tense few hours, shepherded them into Cadiz where they remained, cooped up, until the morning before Trafalgar: 21st October, 1805. Nelson’s fate in that battle is famous. Collingwood’s, at the head of the lee column of battle, was to be first into the fight and last out of it, with fifty dead and many more wounded. Surviving his friend and comrade, Collingwood found himself at the age of 57 in command of the British fleet of 27 ships of the line, most of them virtually wrecks. That no British ship was lost in the hurricane that followed is an almost miraculous testament to seamanship and raw courage; that Collingwood felt forced to sink or burn all the enemy prizes (depriving the officers and men of the fleet of small fortunes) proved a decision which attracted the highest praise of his superiors and the everlasting enmity of some of his captains. The years after Trafalgar, when the newly-created Baron Collingwood became virtual Viceroy of the Mediterranean were, as the historian Piers Mackesy put it, ‘not of battle. The fights were small, fierce encounters of sloops and gunboats, cutting-out expeditions, attacks on batteries. Only once did the enemy come out in force. Yet the scale was heroic; and over the vast canvas towers the figure of Collingwood.’ His management of delicate diplomatic relations binding fragile alliances of deys, beys, pashas, emperors, kings and queens was extraordinarily sure-footed. He prevented the French fleet from holding any part of the Mediterranean. His conduct in exploiting the Spanish anti-French uprising of May 1808 paved the way for Wellington’s ultimately successful Peninsular campaign. By the time that he died, at sea on March 7th 1810 on his way home from Menorca, he had ensured final British victory at sea against the French not by winning battles, but by preventing them. That Collingwood gave his entire professional life for his country in the hope of eventual peace says much about the time in which he lived and even more about his personal qualities. That he never saw England or his wife and children for the last seven years of his life is a tragedy. That he has spent the last 200 years almost entirely neglected, overshadowed by the exploits of his brilliant but flawed friend Nelson, is a historical injustice which his bicentenary ought, finally, to redress. Max Adams’s biography ‘Admiral Collingwood, Nelson’s own hero’ (Weidenfeld & Nicholson 2005) was written as a result of a Winston Churchill Fellowship enabling him to research and travel in Collingwood’s wake. A bicentenary edition of his book, ‘Collingwood, Northumberland’s Heart of Oak’ is now available from Newcastle Libraries, Tyne Bridge Publishing.